A: Hi Alina! First of all, Happy New Year to you! Thank you for taking the time to talk to us about your career before joining Mobiversal. But first things first. Please tell us something brief about you. Al: Hi Alex! Happy New Year to you too! Well, some things about me. I moved from one town to another for a few times. My last move was from Brasov city to Oradea, and I hope this time is the last, but you never know what the future might bring. I love travelling to other countries and also around Romania. There are so many amazing places to see, to get to know how other people think, their mentality and customs. My hobby is social dancing and I do it every time I have the ocasion. A: I know you have graduated from a technical College many years ago. So in a great measure it had to do with technology. Tell us a bit about your academic background and how was it to study technology back then compared with nowadays requirements. Al: Yes it’s true! The fact is that the College I graduated from was more about electronics and robotics, so I can’t really make a comparison with software engineering. The only comparison I can make is from high school where I learned Pascal. The programming language that we use now is far more advanced than Pascal. A: Now I’d like to ask you about your professional background. Please share with us a bit about your job before joining Mobiversal. What did you do exactly and what was your profession? Al: The position I held was that of Frontline Coordinator. In my opinion the title didn’t match at all with the job description. I was doing all that was necessary to make the department run efficiently, from hiring employee to supplying all the equipments necessary. For the part involving human interaction, the job description was mainly the following: taking part in interviews when hiring new employees, promoting the company, delivering training, implementing work schedule in shifts in order to maintain levels of KPI’s, scheduling the employees’ holidays, communicating with other departments (with the technical department for major damages, with the commercial department for new offers in order to inform the clients correctly, with the legal department for the disciplinary sanctions report or for firing an employee, with the software department to improve the applications we worked with making the job easier for employees, with the upper management to receive offers for team buildings, and other activities to motivate the employees). Some other tasks were: taking care of the office supplies: paper, phones, computers, headphones, desks, chairs, etc, producing reports about the department KPI’s (daily, weekly, monthly), evaluating team management, updating work procedures, finding ways to motivate the employees, and a lot more. A: When did you feel it was the time to make a 180 degrees change in your life? Did some particular situation strike you or maybe it was an event that triggered your attention to IT. Al: I started thinking about changing my job after my baby boy was born, because I didn’t have enough time to spend with him. There were days when my child didn’t see me at all. I headed to work before he wake up in the morning and when I came back in the evening he was already asleep. The moment I made the decision was one evening when I came back from work very tired and stressed. My baby was crying and I found myself shouting at him. That was the moment I realized that my job was unhealthy for my family because it was driving me crazy literally and I made the decision to change it. A: For those who are reading this interview, what does a normal person who works 9 to 5 does if they decide to make a shift toward the IT domain? What did you do for example? Was it a course in particular that you took in order to acquire the information? Al: After I decided that I wanted to work in IT, I want to stress out that it was a long process and I thought about it thoroughly! Then, I took a six-months course at “The Informal School of IT” where I was introduced to Java programming. A: Did you find it hard to learn the basics of programming? How many hours per day should someone put the effort in for such a transition to work? Al:Yes, it was very hard for me because I had to learn it between spending my time at the office and my family. During the day I was at work and in the afternoon I did the chores at home. Only at night I could find some time to learn when it was all quiet. My husband and my mother helped me a lot in those months so that I could learn. About the amount of hours, one has to invest in learning I think that depends for each person. If one is a quick learner I would say probably 4 hours per day, if not more. A: Put yourself in a starter’s shoes! What advice would you give to a professional that wants to change his/her career path towards programming? What should he know? Al: My advice is to choose this field only if you like programming, because in this field without passion or hard work the process is not rewarding. A: You have been working for some time now as a developer. Where do you see yourself in, let’s say 5 years? Do you still think you will be working in programming? Al: I chose programming because I like it and of course I see myself still doing it in the future. Maybe not exactly like now, but in a non stressful way. I also see myself travelling a lot and while relaxing on a beach or at a restaurant I will simply open my laptop and write code for my own programs. 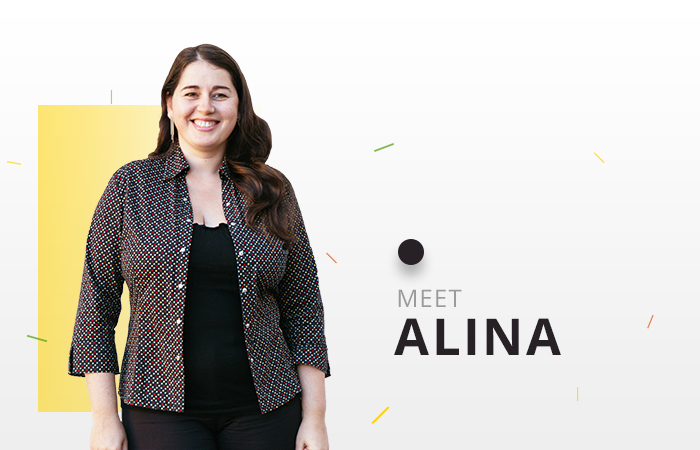 A: Alina, I want to thank you greatly for taking the time to describe your career path until now! I trust that many of our readers will be inspired by your journey and will also have the courage to make a change in their lives. Al: You’re welcome Alex! And for our readers my advice is to have the courage to do what you love because it’s the most rewarding way of living.